For every male music producer that becomes a household name, there is a female counterpart who deserves the same notoriety. Despite producers like Patrice Rushen and Missy Elliott who are recognized as musical pioneers, others like Angela Winbush and KING who are just as adept behind the boards are still wholly underrepresented in media and on the Billboard charts. In recent years however, women producers have made folks sit up and take notice. No longer willing to bide their time waiting for major label backing, these musical architects are taking matters into their own hands by creating and releasing music on their own terms. This class of fearless women, including Jack Davey, Georgia Anne Muldrow, Gwen Bunn and THEESatisfaction, know exactly what they want. Parlour reached out to discover how these ladies began, what they’ve learned and how they exist in the music industry. Look out for a fresh installment over the next few weeks! Although Madlib handled most of the production on her most recent CD, Seeds, it wasn’t due to a lack of skills on Georgia Anne Muldrow’s part. 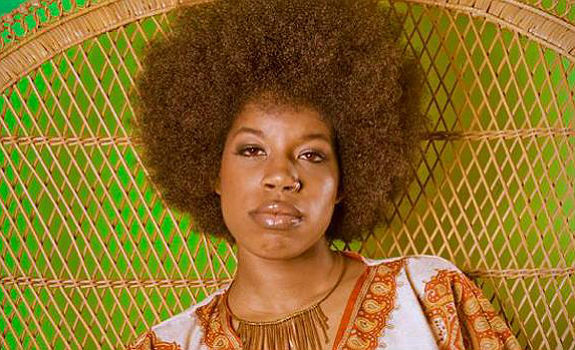 The multi-instrumentalist has largely produced and provided the instrumentation on her past solo albums, in addition to crafting beats for others, including Mos Def, Erykah Badu and her husband, fellow artist Dudley Perkins (aka Declaime). For a California girl whose lineage includes a grandfather who was the late jazz guitarist Ronald Muldrow and a mother who is the musical director of Agape Spiritual Center in Culver City, California, it’s no surprise that music courses through her veins. Parlour: What instruments do you play and when did you start? Georgia Anne Muldrow: I play drums, percussion, drum machines, computer programs, synthesizers, bass, guitar, improvised electronic circuits and my throat. I started to be really serious about music at nine years-old. Would you or have you produced for other artists? Producing is what I do for a living, I’m a producer first. Sometimes folks use the beats I’ve already made, sometimes I make beats just for them and sometimes I make new arrangements with the artist present. I love it all but my favorite is when the artist delivers a real humane message, then everything comes together on another level. Is there a new increase in female producers, or is it just a matter of these women gaining more visibility on the Internet? There’s an increase of music producers as a whole! So much to the point that women cannot be denied anymore and it’s all due to the fact that technology is granting major access to all people. Pick any professional quality DAW (Digital Audio Workstation), and it’s a university in itself. How has the industry reacted to your production talents? Have you had to prove yourself? I dig the fact that a few folks show love when stuff’s released, however it’s imperative for me to prove to myself that my creativity is unlimited. The challenge keeps my imagination healthy and active. I’m in the dark as to how the industry even applies to me, I guess I haven’t made it matter enough to care. It’s probably because the corporate structure that has encroached upon creative people became a played out phenomena in my mental space. I don’t see industry, I see beautiful artists with big hearts on a collaborative mission all over the world, which is a naïve but true statement.